Belhaven University is nestled in the heart of Jackson, Mississippi's historical district. 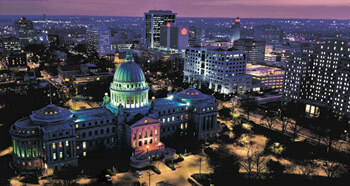 Jackson, the capital and largest city in Mississippi, is a growing center of industry, commerce, culture, and the arts. Jackson prides itself on its residential areas, its impressive state and city office buildings, its spacious parks, and its progressive spirit. This Old House magazine named Jackson's historic Belhaven neighborhood as one of 61 Best Old-House Neighborhoods for 2013 in the United States and Canada. Belhaven is the only Mississippi neighborhood to make this sixth annual list. Belhaven was noted for its walkable, tree-lined streets, houses and buildings of different styles, historic standards, Eudora Welty's home and garden, proximity to downtown and Belhaven University at its heart. Surrounded by early 1900's homes and shady oak trees, Belhaven is minutes away from the interstate, great restaurants, and cultural attractions. Centrally located in the Southeast, Belhaven is a day trip away from the blues and BBQ of Memphis or a weekend away from New Orleans or the Gulf Coast. In just fifteen minutes you can drive to the Jackson International Airport to catch a flight to home or to a spring break destination. Jackson truly is in the middle of it all! Set up a campus visit and come see for yourself! Need to spend the night? Check out local accommodations. Every fourth year, Jackson hosts the prestigious International Ballet Competition, rotating with Varna, Bulgaria; Helsinki, Finland; and Moscow. The area's reputation for artistic variety extends beyond this international event and encompasses some of the finest regional theater, opera, ballet, and symphony groups. We aren't the only ones that think Belhaven is a great place to live. Read some national coverage Jackson has received from places like the New York Times and CNN.